Isn’t Christmas the most wonderful time of the year? We sure think it is! Since it is such a wonderful time of the year we thought we would get a head start on the Christmas decorating. We have a treat for you today! 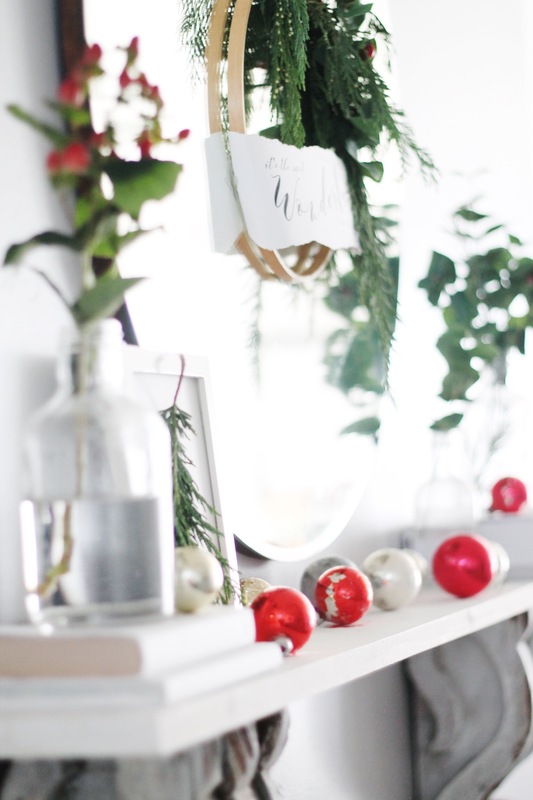 We have teamed up with 32 other creative ladies to give you FREE Christmas printables to help you decorate for this holiday season. We would like to thank Kristen from Ella Claire Inspired for hosting. She has a bebeautiful blog so go check her out. Every year starting in November we turn on those Christmas tunes and they always put us in the most happy and festive mood. Our all time favorite Christmas song is “It’s the Most Wonderful Time of the Year” by Andy Williams. With that favorite song of ours stuck in our head all month we knew we wanted to put that line from the song somewhere in our homes and share with you. 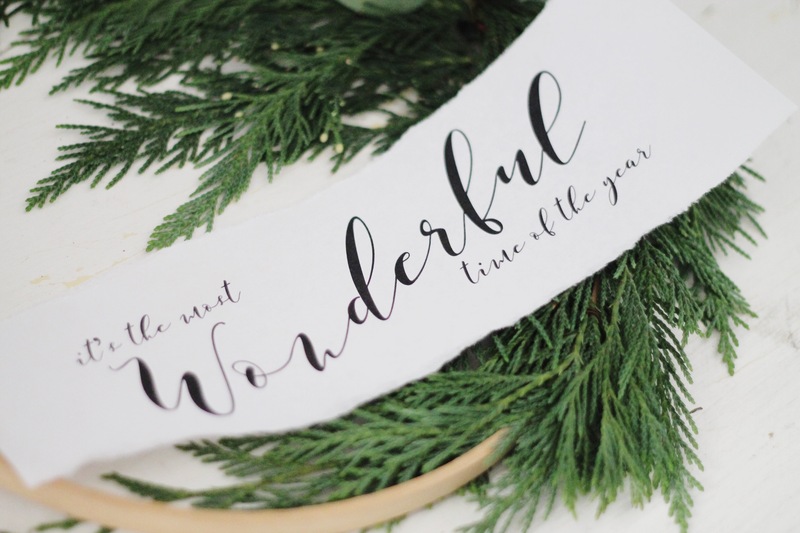 We have created this free printable in hopes that you can use it in your home. 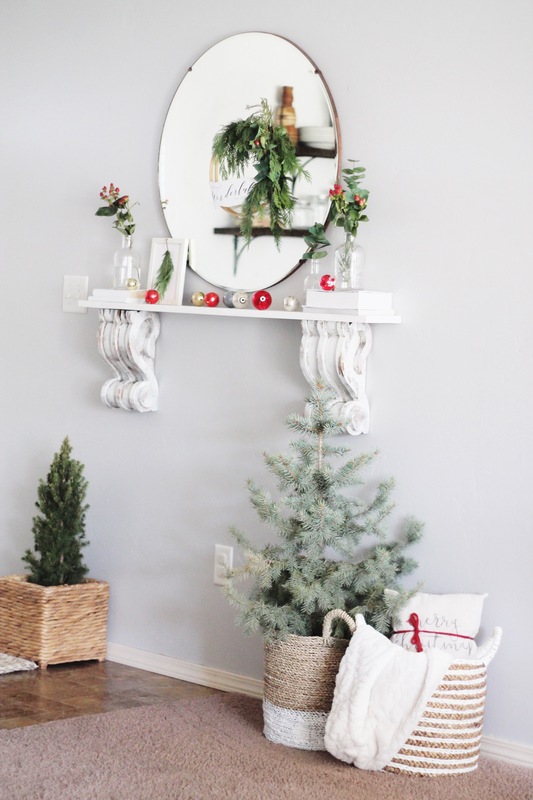 I recently redecorated my entryway, and you may have seen it here. 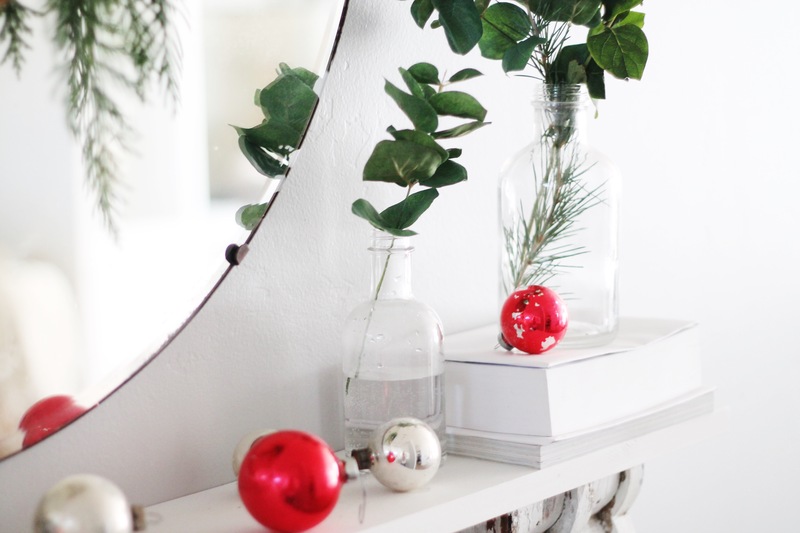 I thought it would be fun to decorate this area for Christmas, seeing that I never have before. 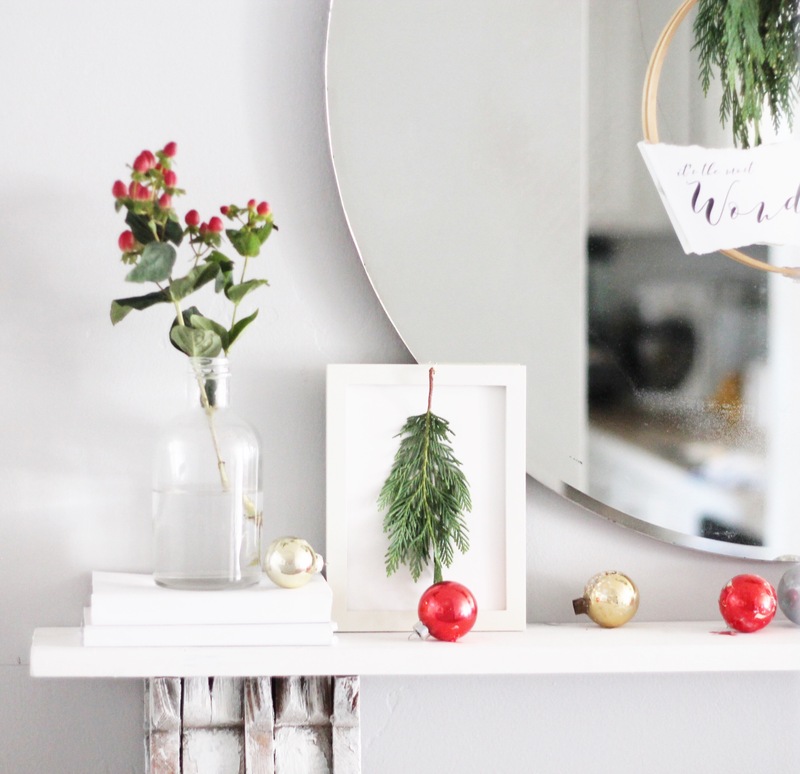 It was the perfect spot to place this free printable. 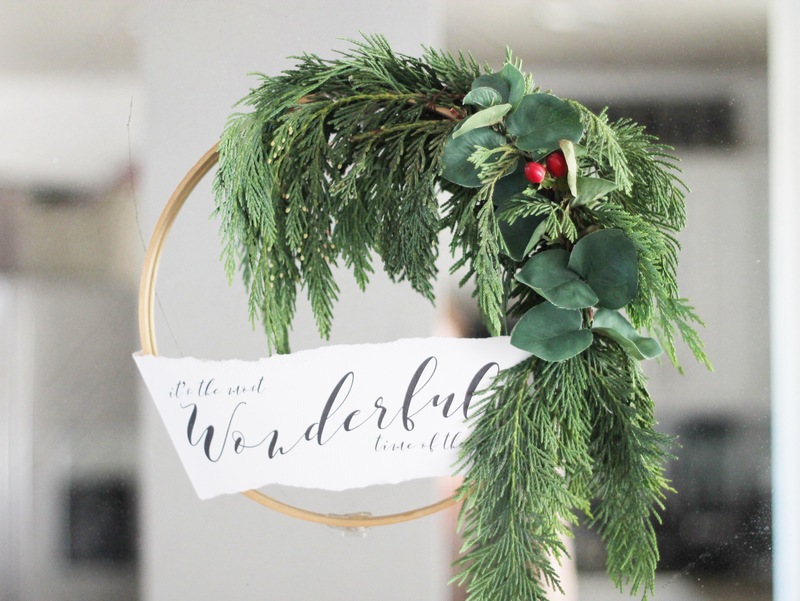 We created this printable and decided to drape it across a wreath. You could also print the printable and frame it. You can download and print the printable here. 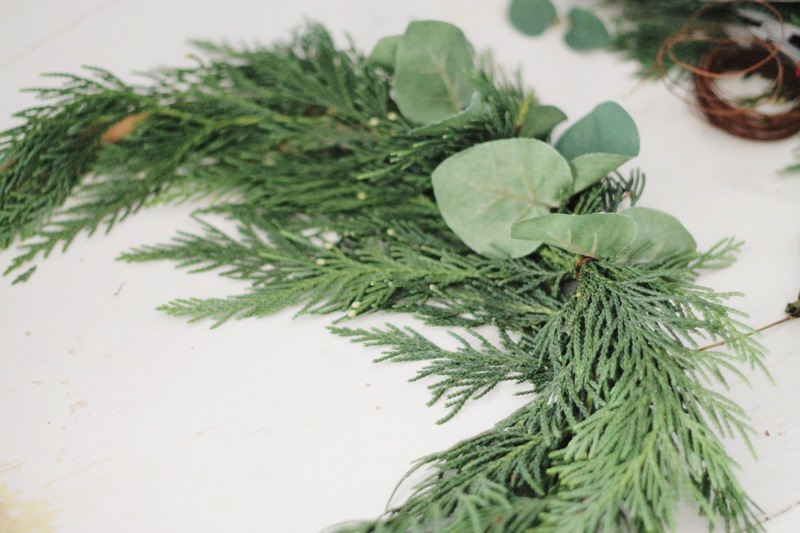 Here is how we created his wreath. We hope you try it out this Christmas season! The first thing you will want to do is gather all of your materials. 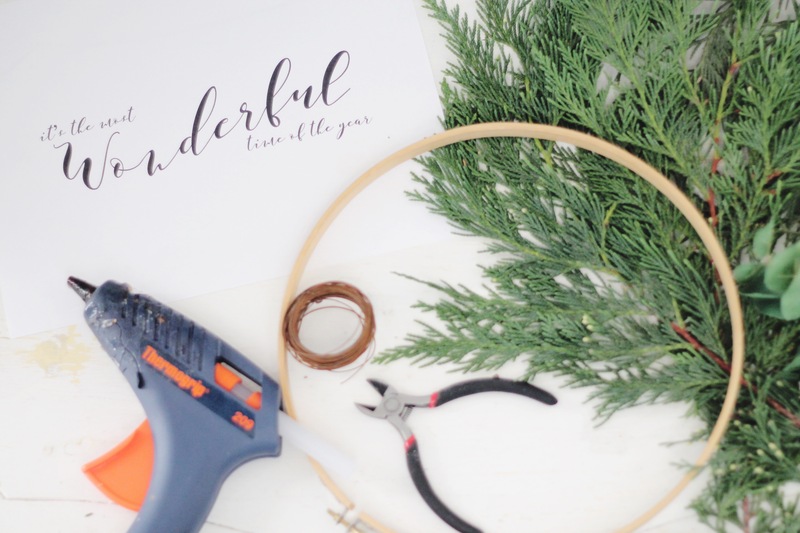 You will need this printable(we printed ours on textured scrapbook paper), a hot glue gun, wire, wire cutters, embroidery hoop(ours was about 10inches in diameter), and greenery. For the greenery we used greens from a tree in the front yard, and a faux stem that I am not sure what it is. If you are using the part of the embroidery loom that has the hardware on it you will want to cover that side with the greenery. 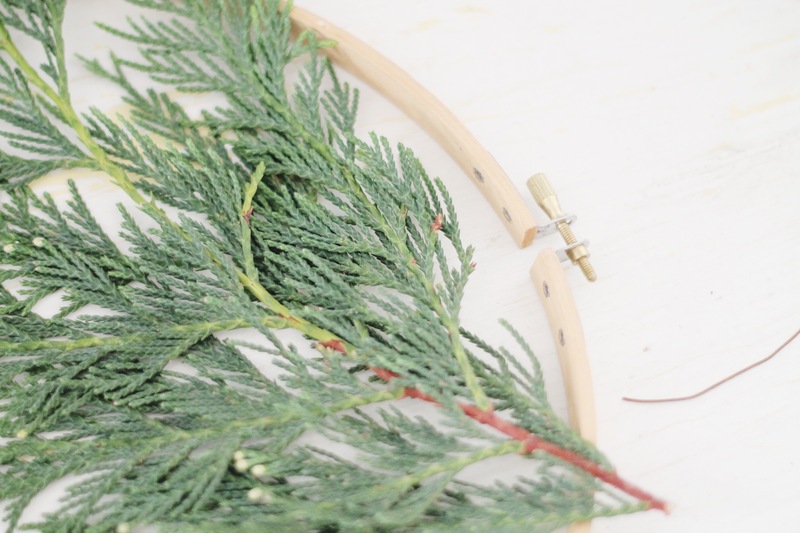 Place the greenery where you would like and then wrap little pieces of wire around the stem of the greenery and the hoop. Keep adding until you are satisfied with how full it is. 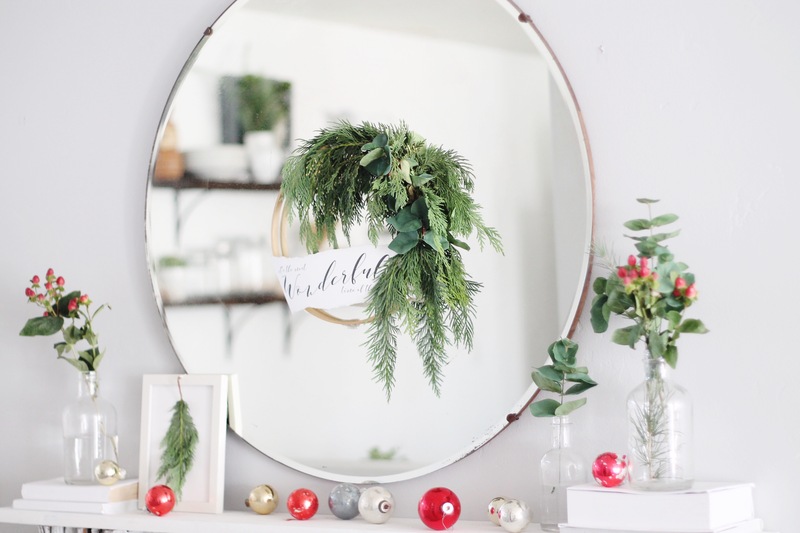 I liked the assymetircal look of only having greenery on one side, but you could continue the greenery all the way around the wreath. I then added the faux stem and some berries. We then took the printable and gently ripped the paper about an inch above and below the words. I loved the jagged edge that is created by ripping the paper. It adds some fun texture. We then found out where we wanted the paper to be placed. 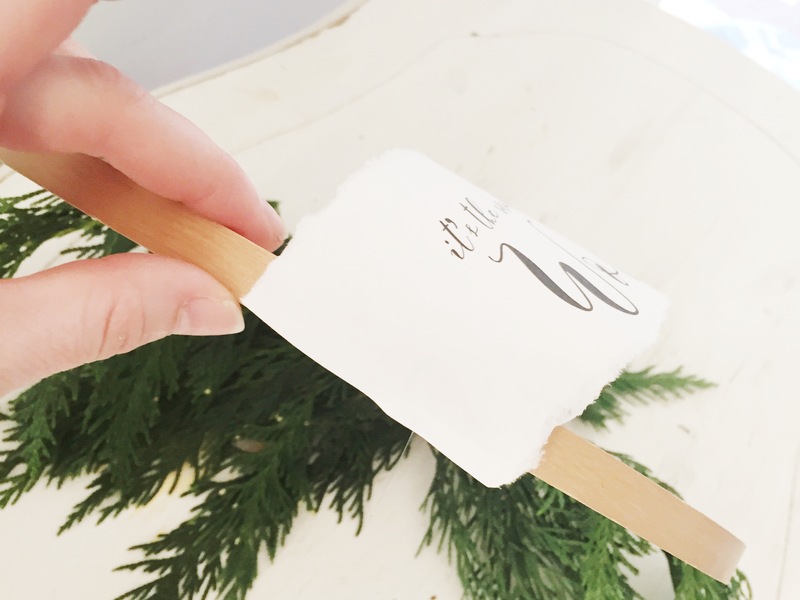 Add some hot glue to the outside edge of one of the ends of the hoop and press the paper to it. Do the same thing to the other side. And that is it! 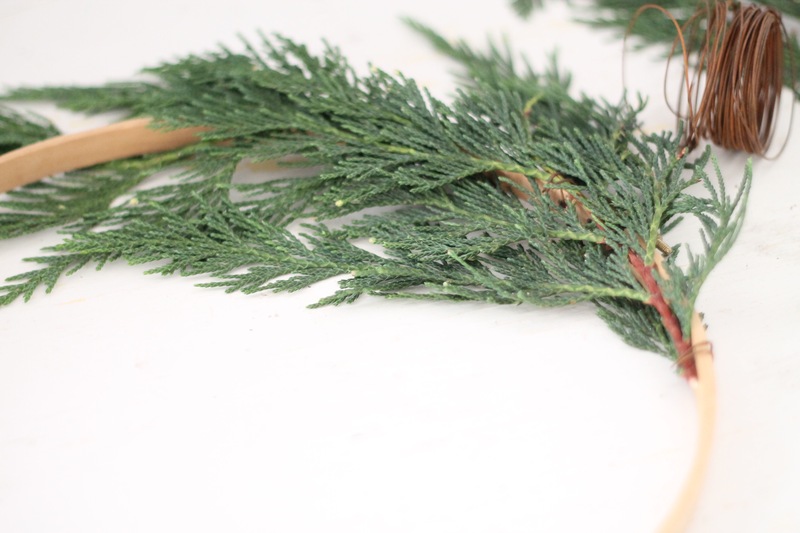 If there are loose ends of your greenery you can hot glue those into place as well. Here is the finished product! 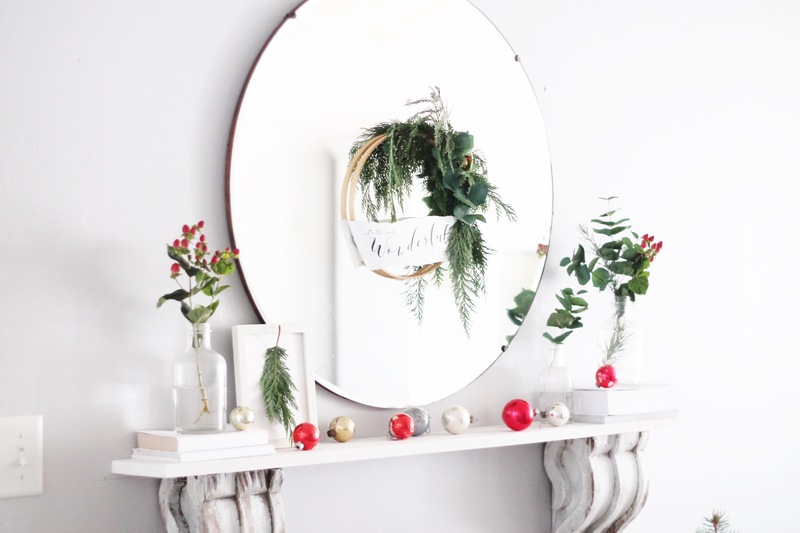 We styled the wreath by placing it on the center of my round mirror in my entryway. I hot glued it to the mirror. I made sure to put a good glob of hot glue on the top, bottom, and both sides to make sure it would not fall. I think it would also be adorable just leaning against the mirror on the shelf, or hung by a ribbon from the top of the mirror. Here is the entire entryway. I added some trees that I found at a local nursery and stuck them in some baskets that I had. I filled another basket with a christmas pillow I made using this method. On the shelf I covered a few books we had with white paper. I love white if you couldn’t tell. 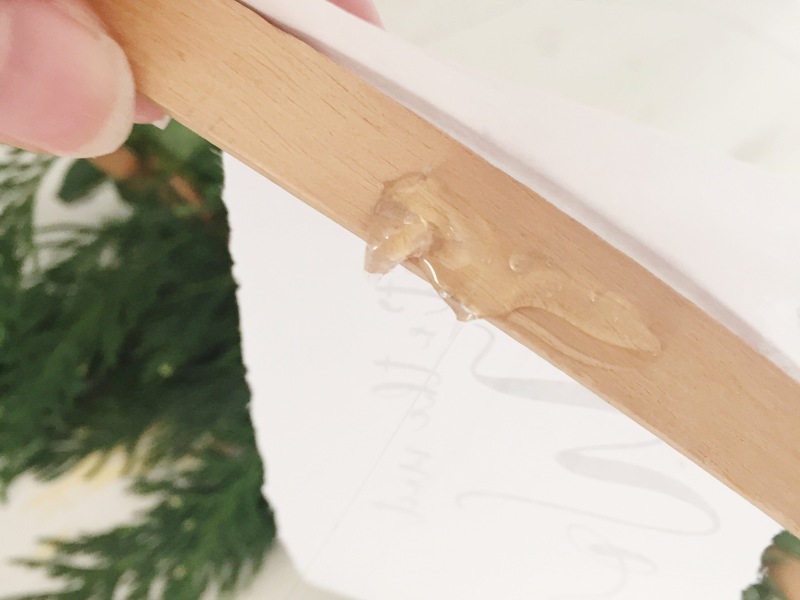 I then glued a piece of weeping cypress to a frame and leaned on the shelf. These bottles are old spice bottles that I had and I filled them with more leftover greenery. Last year while shopping at a favorite antique mall I found these vintage glass ornaments. From my collection, I picked out the red and white ones and placed them on the shelf. I actually ended up using double sided tape to tape them to the shelf. I was a little worried about them falling when someone closed the door. The tape has held them in place nicely. 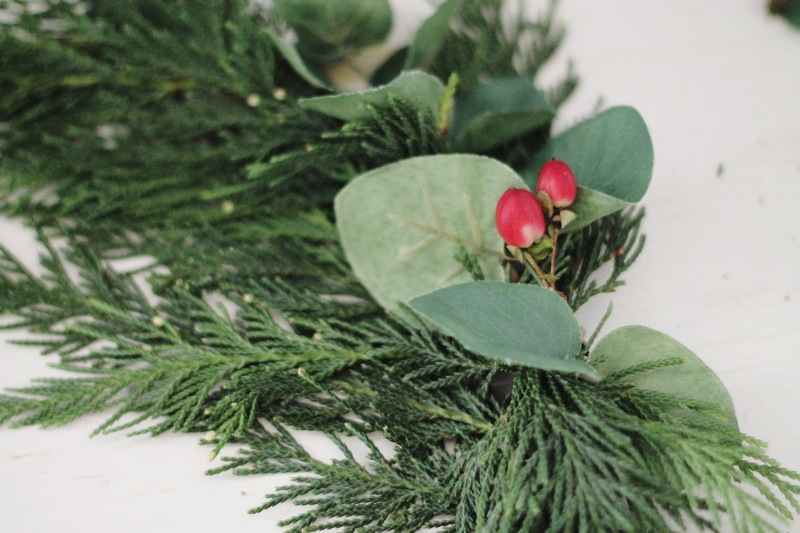 We hope you try our wreath out or use our printable in some other fun way! We would love to see how you use our printable so make sure to share with us. Below are 32 other beatuful free printables. Make sure to check them all out. I know I will be printing a few of them and using them in my home this year! I hope you enjoy and have fun with these! This is stunning! 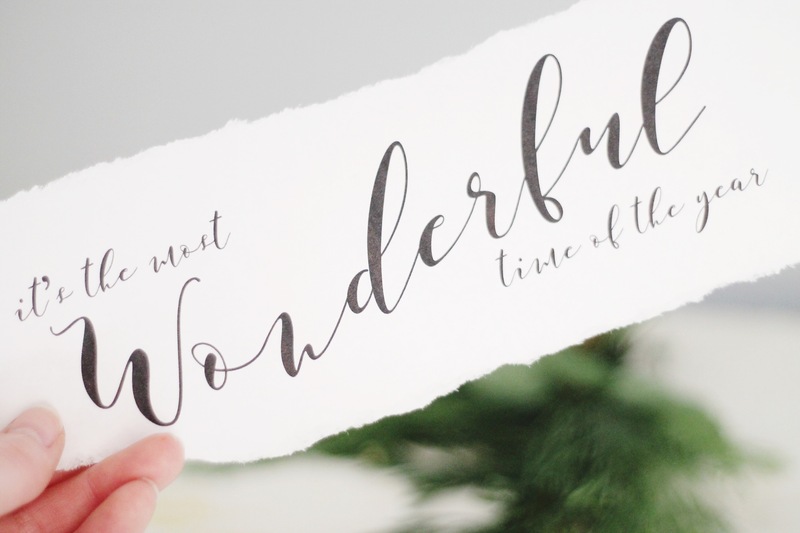 It is the most wonderful time! This is so, so gorgeous!! I absolutely adore EVERYTHING about this! The embroidery hoop is such an awesome idea!! When I try to download the printable it just comes up with a blank screen. 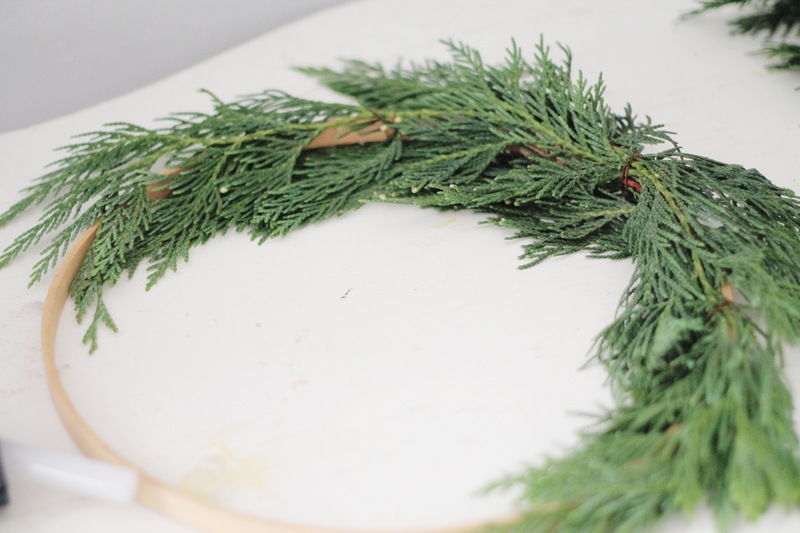 I love that Christmas song, and I love the way wreath turned using the hoop! I would really like to make this for the holidays this year. Can you help me with the download? Hey Patti! Did you ever get it to download. When I try to download it comes right up. Maybe try switching browsers? Or if that didn’t work email me at chelsiallen321@gmail.com and I will email you a copy of it! I did get it. I think it was a problem with my browser. Thank you soooo much! I love it and appreciate your time and generosity! Blessings!